In an exclusive leak to RT, hacktivist group ‘Fancy bears’ revealed documents showing the International Olympics Committee (IOC) was not satisfied with the proof in McLaren’s reports on Russian doping and asked over 50 questions about 16 of those accused. The group called ‘Fancy Bear,’ which is known for their hacks of the World Anti-Doping Agency (WADA)’s medical data on international athletes, has now come by a letter from the IOC to Canadian lawyer Richard McLaren – the author of the infamous WADA-commissioned report on allegedly widespread state-sponsored doping practices in Russia. In the letter, the IOC demands that McLaren provide evidence to support his allegations that Russian Sports authorities and FSB officers were in on the doping plot. The letter provides an 11-page table with 16 names and entities that are mentioned in the reports, each followed by a lengthy number of questions regarding the person’s alleged links to the doping case. “We started to transform your reports into allegations with associated evidence against individuals, in order to first request the observations by the individuals concerned and subsequently propose possible sanctions to the IOC Executive Board. In order to facilitate this process, we have developed the attached table. 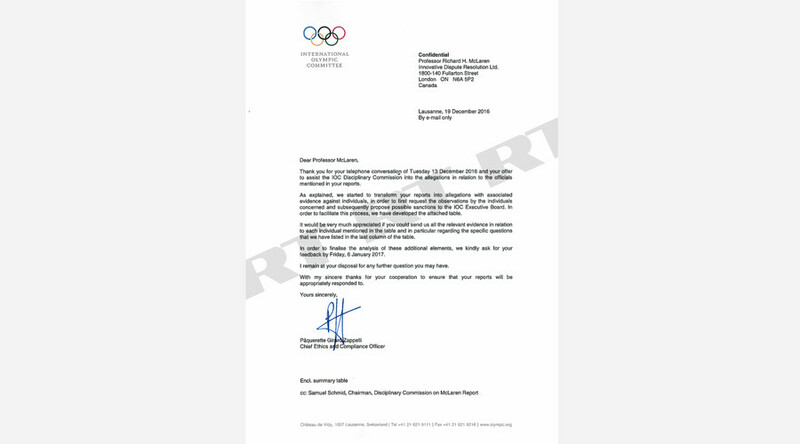 It would be very much appreciated if you could send us all the relevant evidence in relation to each individual mentioned… in particular regarding the specific questions that we have listed,” the letter from IOC Chief Ethics and Compliance Officer Paquerette Girard Zappelli states. In the table mentioned by Zappelli, almost every name is followed by a question “how to demonstrate,” meaning that the IOC apparently did not see direct evidence of the person’s alleged ties to the doping scandal. For instance, the IOC asks how exactly McLaren could prove that Irina Rodionova, the former deputy head of Russia’s Sports Preparation Center, was in charge of creating lists of clean urine samples for swapping during the Sochi Olympics, when she worked as head of Anti-Doping Monitoring and Management. It also asks how McLaren could demonstrate that it was Rodionova who convinced the deputy minister of sports at the time “to retain the doping conspiracy,” as claimed in the report. Regarding Grigory Rodchenko, the former head of the Moscow Anti-Doping Laboratory on whose accusations McLaren initially based his report, the IOC asked for more information on his involvement in the Sochi doping swap, as well as proof of his role in creating the advanced doping cocktails that were allegedly given to the sportsmen, including the “Duchess” listed in the report. Among the 56 questions that the IOC had for McLaren, it asked how he could prove the Russian FSB’s alleged involvement in the doping scheme, as well as Sports Minister Vitaly Mutko’s “leadership and knowledge of the conspiracy from 2011-2015.” It also wanted to know what evidence he had showing the involvement of officials from the Department of Education and Science and RUSADA, the Russian anti-doping agency. The IOC raises specific questions as to the alleged participation of those accused in covering up the doping, including their interactions with the doping lab and the implicated sportsmen. 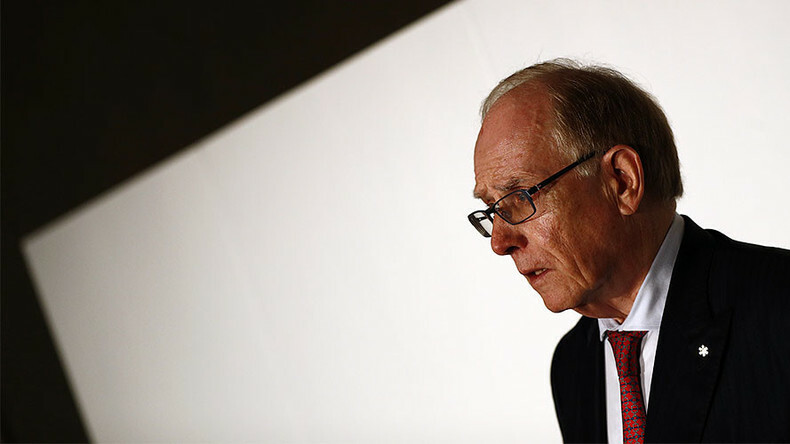 The unearthed table raises questions regarding the role of practically all of the people mentioned in McLaren’s report as instigators of the doping cover-up scheme. The abundance of clarifications demanded by the IOC suggests that McLaren had been working backwards on his highly-publicized report, drawing conclusions before presenting the evidence for them. The IOC is not the first to demand clarifications concerning the McLaren report. 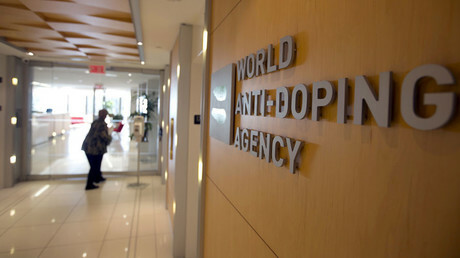 In an earlier leak, the same hacktivist group published a letter from the former director of WADA’s accredited doping Laboratory of Lausanne, Martial Saugy, in which he accuses McLaren of making “incorrect allegations” that the Laboratory intentionally destroyed urine samples of Russian sportsmen that the report claimed had been requested by WADA. Saugy gives a detailed account of the events that prompted McLaren’s allegations and sullied the reputation of both the Lausanne lab and Saugy himself, while providing letters and records to prove that the samples were destroyed in full compliance with standard procedure. Furthermore, Saugy states that WADA itself never complained to the lab about the destruction of these samples, though McLaren’s report stated that the Lab destroyed them after WADA had “specifically requested” them. 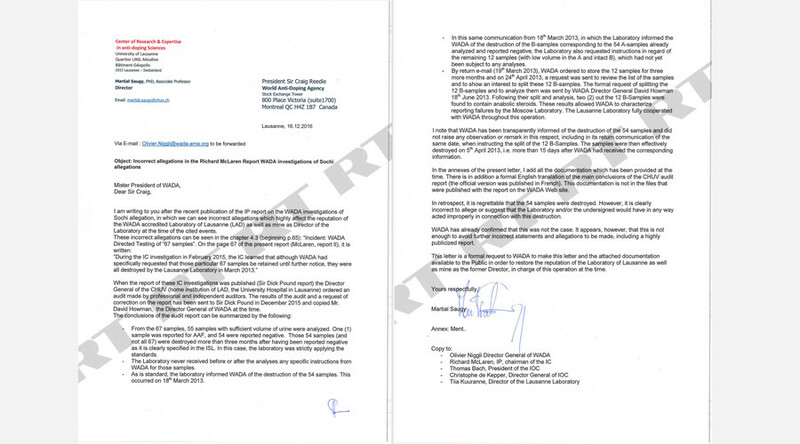 Saugy requested that WADA make his letter and the attached documents “available to the public in order to restore the reputation of the Laboratory of Lausanne” and Saugy himself. As of yet, WADA has failed to do so, however. The first part of McLaren’s report, which presented the results of his investigation into doping at the Sochi 2014 Winter Olympic Games, was published on June 18, 2016. Based on his findings, WADA recommended that the IOC, the International Paralympic Committee (IPC), and all international sporting federations exclude Russia from their competitions. The entire team of Russian Paralympians was consequently banned from Rio. The second part of the report that came out on December 9 also claimed that over 1,000 Russian athletes participating in summer, winter, and Paralympic competitions had benefited from the alleged plot to conceal positive doping tests. As a result, the International Ski Federation (FIS) suspended six Russian skiers, including Belov and Legkov. Four Russian skeleton athletes were also provisionally suspended from competing by the International Bobsleigh and Skeleton Federation (IBSF), but their suspensions were lifted on January 8 as the federation found insufficient evidence to justify the ban. Following the WADA publications, Russian President Vladimir Putin temporarily suspended all officials mentioned in the document from their positions until a probe was completed. He also ordered the creation of an independent public anti-doping Commission in Russia that would work under the guidance of Russia’s senior member on the International Olympic Committee, Vitali Smirnov. Last fall, WADA President Sir Craig Reedie praised these efforts, saying he was pleased with Russia’s work in the struggle against doping.